RockHer offers a wide range of diamond shapes to choose from and only carries diamonds with the highest quality grades. Choose your shape: Round, Princess, Emerald, Asscher, Oval, Marquise, Cushion, Radiant, Pear and Heart. Each shape has a distinct style you're sure to love. Each cut has a distinct look and feel, you're sure to find a RockHer engagement ring that is uniquely yours. The artisans at RockHer have designed a collection of round cut diamond engagement rings that span a variety of styles Due to the intricacies this cut, the round diamond is often superior to other fancy shapes at reflecting light, maximizing the diamond's potential brightness. The Cushion Cut diamond is a breathtaking interpretation of the classic pillow cut, expertly finished with RockHer's distinct hearts and arrows motif. This attractive diamond shape is well-suited for use in a many settings, but is most often the centerpiece of a stunning engagement ring. 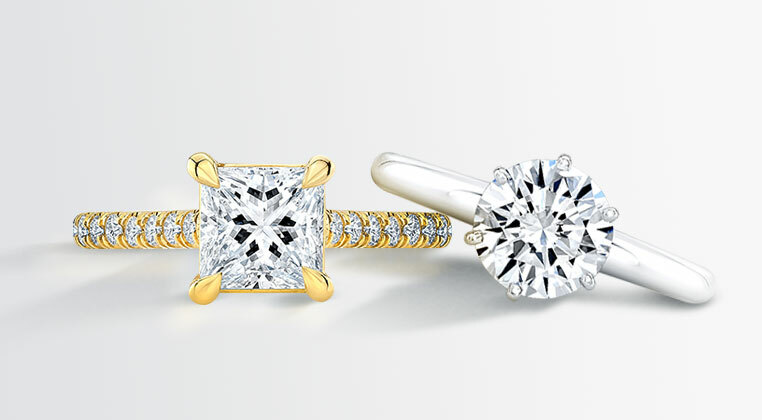 One of the most popular fancy shape, princess cut diamonds maximize their sparkle while maintaining a chic square shape. With the ability to look amazing in many different settings, these versatile gems can be as stunning as solitaire and three stone settings, or add a modern touch to antique or vintage styles. Emerald cuts have a unique trait, when compared to another cut of the same carat, the top of an emerald cut diamond will look noticeably larger. Although different from a traditional brilliant diamond, the corner edges of an expertly cut emerald diamond will still sparkle like no other. A modified version of the round brilliant cut, RockHer's haute oval cut diamond is known for its perfect symmetry and unique shape. Popular among women who are looking for a vintage-inspired engagement ring, its elongated shape accentuates the length to the hand, allowing for the appearance of long, slender fingers. With wider corners, the RockHer Asscher cut diamond captures more light from all angles, producing a distinct pattern of repeated squares. The result is a showstopping diamond engagement and wedding ring that can outshine even the brightest cuts. The radiant cut diamond is one our most intricate diamond shapes. Our diamond experts painstakingly cut 70 facets into each radiant cut diamond, allowing them to emanate a tremendous amount of shine. RockHer's pear shaped diamond is a combination of a round and a marquise shape, with a tapered point on one end. The handcrafted diamond is always worn with the narrow end pointing toward the hand of the wearer. Like marquise and oval cuts, the pear shaped diamond comes in a variety of slim to wide cuts, and has the added benefit of accentuating the wearer's fingers, making them appear longer and slimmer. Compared to other vintage cuts, a Marquise cut diamond engagement ring stands as an uncommon choice, making it preferred by brides with who gravitate toward unique shapes. Featuring 56 facets and an elliptical shape with pointed ends, this diamond features high grades of brilliance and fire, sure to turn heads at any event. When choosing one of RockHer's heart shaped diamonds, remember that perfect symmetry is very important, since it is critical that the two halves of the heart are identical. The cleft (between the two lobes) should be sharp and distinct, and the wings (the sides as they curve down to the point) should be slightly rounded.